Anchovies Stir Fry / Nethili Meen Varuval is one of my Childhood favourite. Here in my place these fishes are’nt available all round the year. This is somehow seasonal. Now in september these fishes are in season. Anchovies are the tiniest fishes and fries in very less time. They are tiny in size but provides essential fatty acids, protein and many other nutrients. In addition to protein anchovies are rich in calcium and iron too. Mom always fries anchovies in coconut oil which can be the best flavour i guess. 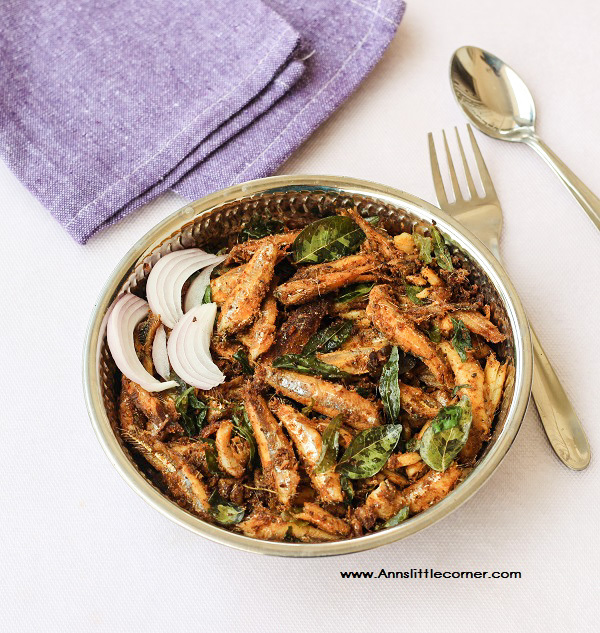 Anchovies Stir fried in Coconut oil and Curry leaves is simply tasty. Anchovies sometimes have a slight bitter taste. The process of roasting it with coconut oil and curry leaves makes it super delicious. Coconut oil improves digestion. Its good for skin and hair health. It supports immunity. Boosts metabolism. Slows fine lines. And many more. Above all it gives an awesome flavour to the dish. 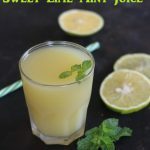 If you are a coconut oil lover then this recipe is a real delight. 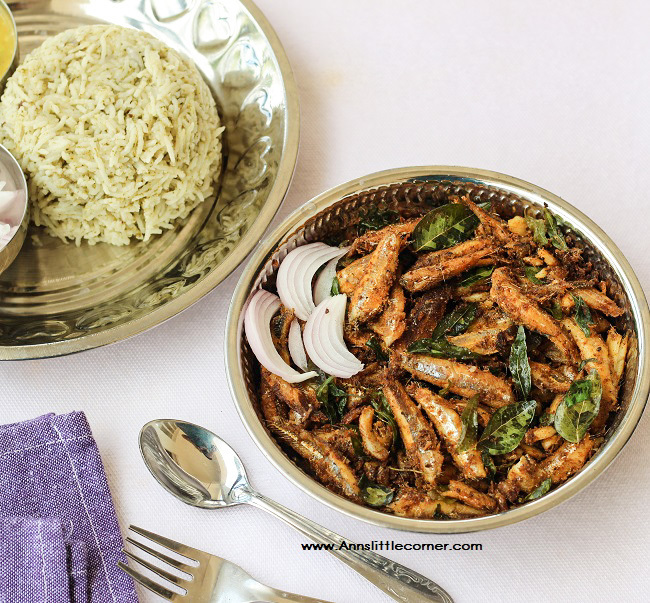 Anchovies Stir Fry / Nethili Meen Varuval is a Nutritious and tasty stir fry. Clean the Fish. Remove the waste from the fish. Add in all the marination ingredients into the fish. Leave it for atleast 30 minutes. Add in Curry Leaves. Roast Until crisp. Remove them from oil. Add in the marinated fish into the same oil. Roast the fish until they are completely cooked. Stir gently. Add in the roasted curry leaves into the anchovies fry. Anchovies stir fry is now ready to serve. Anchovies are tiny and tender fish and they cook very easily. While roasting the fish in coconut oil stir gently or the fish might break easily. Stirring the fish while roasting is essential as it might stick to the bottom. Apart from the marination time the anchovies stir fry can be made in under 30 minutes. Wash and Clean the anchovies. These fish range from very tiny to medium size. The one i have used is a tiny ones. Remove the waste from the fish as shown in the picture. Get Ready with the ingredients for marination. Add in all the ingredients listed under to marinate and leave for atleast 30 minutes. Heat coconut oil in a wok. Add in curry leaves and roast them crisp. Remove the curry leaves from the coconut oil. Add in the marinated fish. Keep stirring slowly until the fish is cooked completely. Add in the roasted curry leaves. Give a quick stir. Flavourful Anchovies stir fry is now ready to serve. Don’t be so hard on yourself. Love all your clicks and yes we do wait for your vegetarian recipes as bell. That said this anchovies curry is perfect treat for sea food lovers. Anchovies fried with Coconut oil and Curry leaves is always a bliss!! Wish i get a plate of the anchovies stir fry, ages i had this much fresh fishes. Coconut oil in varuval, my god my mouth is just watering here. I remember mom making a delicious tangy gravy with nethili meen which was everyone’s fav in house. I haven’t tasted the fried version. If ever I get a chance, I will try this recipe for sure as it looks super tempting.. I do not know how to cook fish but love to eat them. These look super delicious. Nice stir fry for fish lovers. I like the spies used in the dish. Good clicks and am sure its tempted all the fish lovers. Lovely and interesting recipe for fish lovers. The flavor that coconut oil imparts is just amazing. But I have to agree that it’s an acquired taste. I am using it so much more than before even though the husband is not a big fan. I use it even as my lip balm :D. Coming to the post, I can imagine how difficult it must be to be away from the kitchen and the camera. But thank god for the drafts !! Lovely fries that too with coconut oil. Stunning pics. Such a wonderful recipe for fish lovers.Use of coconut oil and curry leaves takes it to a next level.